myClub Legend Campaign Volume 5. Netherlands' iconic number 14 comes to PES/Winning Eleven! Johan Cruyff, the legendary Dutch player and genius behind the philosophy of Total Football, is set to appear in PES/Winning Eleven. Known all over the world, Cruyff revolutionised soccer thanks to his magnificent playing style, ability to have absolute control over the ball and (as a manager) innovative tactics. After his retirement, Cruyff became the coach of FC Barcelona where he won four league titles, resulting in him leaving behind a successful legacy both on and off the field. Additionally, his most famous move, the "Cruyff Turn" has appeared as an in-game skill move in PES/Winning Eleven series for years, helping players bamboozle opponents! 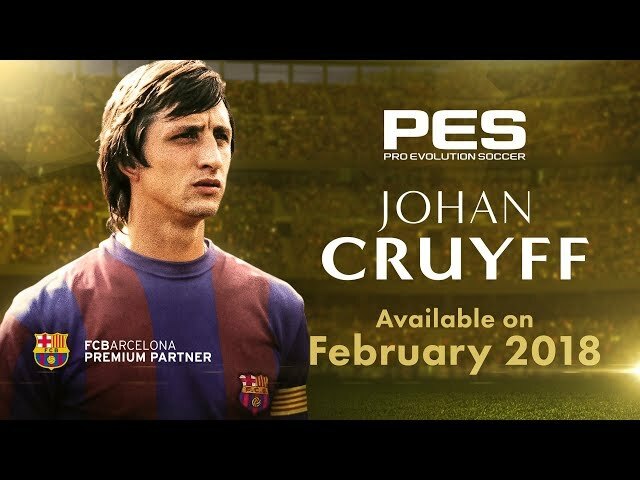 Johan Cruyff will be appearing in PES 2018/Winning Eleven very soon!